FAIL! (144/365 year 3) – Annoyingly Boring? No, I have not failed the project. I am still shooting. Just totally choked on Friday’s shot. 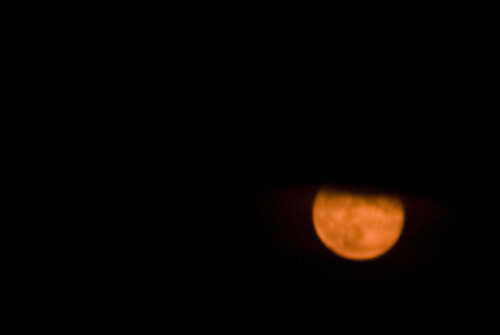 I think there was a lunar eclipse on Friday, but I am not sure if that is why the moon was so orange. Either way it caught my wife’s eye. She called me out. I shot. Problem was it was so cloudy on Friday night that everything I did was rushed… and the image reflects that. Shooting the moon isn’t easy, but this one is really lame. Oh well. Moving on. I’ll catch up here, but Saturday’s photo(s) are taking me a while to go through/process. Yeah, well… it’s summer. It happens. I’ve been running 3-4 days behind for the past few weeks, myself. Staying tuned…! I actually really like this one. Doesn’t look like a fail to me at all. Aw, Pat. We’ve all been thre. But I agree with Letha…I know the result ISN’T what you were going for, but you ended up with sort of an interesting abstract. At first I thought it was a copper penny on a black background. It has a very interesting look to it. So, failure? Hmmm, not so sure!